Fall is finally here! 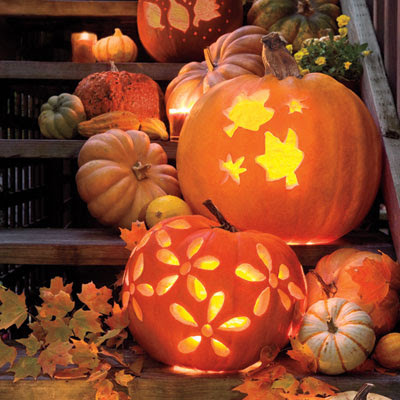 More importantly...it's finally October, which means that we can all begin our fall decorations. I have been contemplating on how to decorate Colby's house this year to get in the spirit of the season. 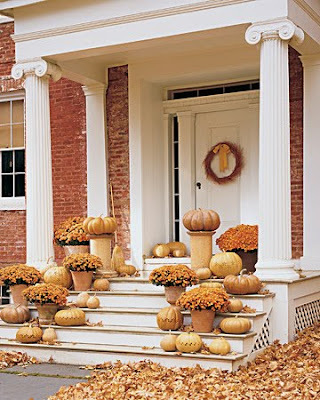 I've finally decided that I will be decorating with potted mums and pumpkins. Hopefully, this will spruce up the house a bit. I've been searching the internet for ideas, and I found a few pictures that I thought were great inspiration. I've decided that I want the decorations to be a bit elegant, rather than scary. I especially didn't want the decorations to be tacky. It seems that sometimes people get a bit out of hand. Here are a few picture that I found that I seemed to be drawn to. I liked the photo above mostly for its simplicity. I'm on a budget, so this is a great way for me to still decorate the house, add some color to the porch, and be in the spirit of the season. I was particularly drawn to the wreath on the door. 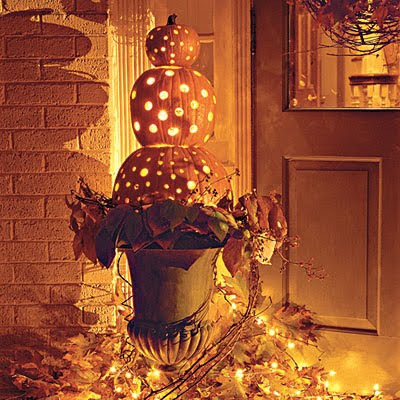 It looks like it would be very easy to make if you had many small pumpkins and some black ribbon. 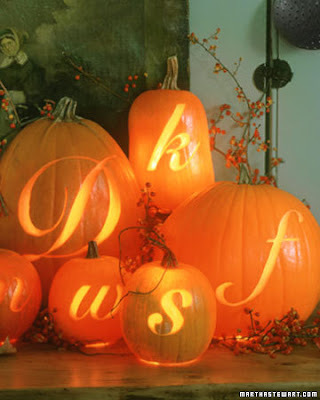 I also liked this photo for the mums and arrangment of pumpkins. 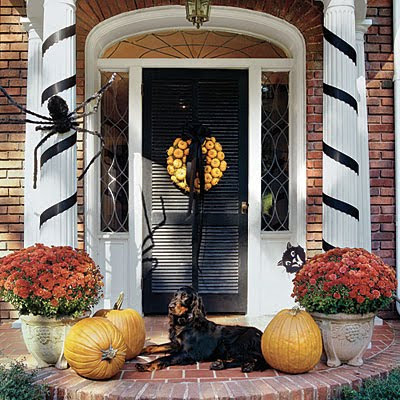 It just demonstrates how easy it is to decorate for fall without all of the ghosts and goblins hanging from the front porch. I'm not saying I'm against all of the typical Halloween decorations. It's just not for me. You can get the tips for this idea here. This is one of my favorites. How pretty this would be by my front door! This makes me wish I had a fireplace in the house. I'll save this photo for future use! I am all about monograms. I loved this, and I may give it a try. I just wonder how I'm going to make it look as good as this one. Hmmm...I guess I will use the directions from the Martha Stewart website to figure it out. Last but not least, an easy way to make decorations. 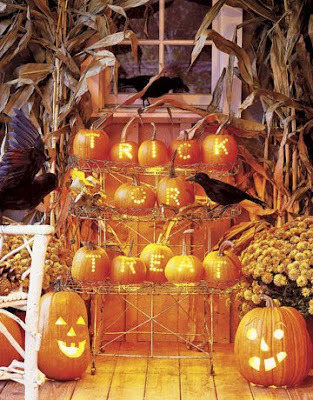 The simple use of a template and some cookie cutters makes it very simply to light up the outdoors when trick-or-treaters come by. I hope everyone enjoyed my thoughts on fall and Halloween decorations! I can't wait to see everyone else's decorations around town. I love your blog! 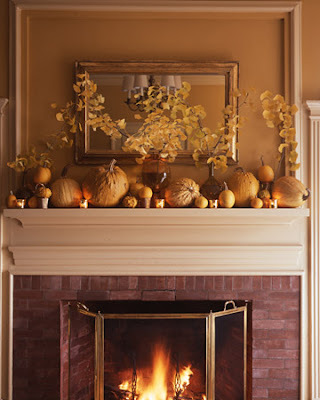 I also love all of these great fall decorating ideas. Judd and I are going to buy some pumpkins tomorrow!!! I can't wait to see what you do at the house. I know it will look great. Welcome to the blogosphere! Thank You! Prayers Were Answered!